Kaleidoscope , by Salina Yoon is an interesting book and a very difficult one for me to try to describe. 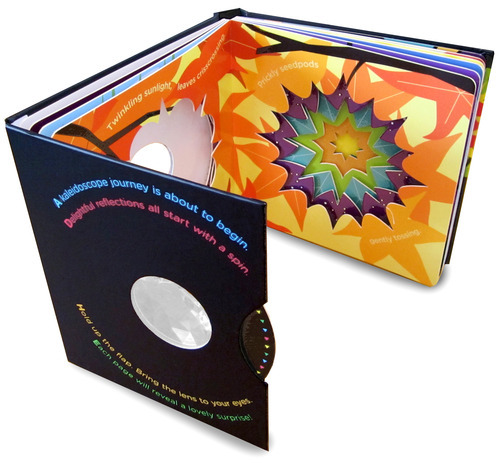 It is a novelty book with a working kaleidoscope built-in which is quite fascinating to children and adults alike. This book is definitely more about the art work than it is about a story. Illustrated by artist Salina Yoon, it is dash of color and simple rhymes. Each page spread only holds four short lines of rhyming text but an impressive amount of bold colors. Basically, Kaleidoscope takes you on a little trip through various seasons, enjoying the color which is a part of each. There are midnight skies and winter snow showers. Each page is quite unique appealing to look at in its own right, even without use of the kaleidoscope. I confess that I've been looking through it and playing around with it quite frequently myself though! It's a small board book cram packed with interesting fun. I have THREE copies of this book to give away to three of you, courtesy of Little, Brown Books for Young Readers. How can you be entered to win? Simply leave a comment below (including a valid e-mail address.) This contest is open to U.S. Residents only and will be open through Tuesday, April 24th. THIS CONTEST IS NOW CLOSED. THE WINNERS, (as selected by random.org) are #5 - Jennifer, #14 - *Carrie* (the other one!) - and #18 - Krista. Congrats, ladies! Thank you, Little, Brown Books for Young Readers, for shooting a copy of this book my way AND for offering three additional copies to my readers. I think my little almost-2-year (gag!) old would love thi! Looks like a really cool book!! I think you did a gret job describing the book: board book with built-in kaleidoscope. It looks like fun! Happy Happy Birthday to you sweet baby girl! <3 Best wishes on your very special day! And, I think your mommy picked a great way to celebrate! A rainbow book on your birthday, what could be better then that? The book looks cute, but I don't need it. Just wanted to say "Happy Burfday!" to your precious little girl! I'd love to win this for my twin grandchildren! They turn two next month and love books. My kids would love this book! What a great way to interact with words! That is such a cool book! LOVE all the colors! I have many young children in my life who would love this book. Hope I get to share it with them! Happy, happy birthday to your sweet girl. My niece turns one today, also, and it was Naomi's due date! Crazy. Happy 1st Birthday to your daughter! Thanks for sharing again with us! This looks so cool. Count me in! Happy Birthday to your daughter! This next year is going to be so much fun for you both! How cool! I'm sure this would be well lovedin our house! This book looks so cool! My kids would love this book! Thanks for the chance to win! Wow! That's a cool book! This looks like a really neat book. I would love to win it. How this year has flown!! My littles turns one this week: such a joy from the Lord!! Thanks for the colorful giveaway! !